So today's foray to the farmer's market got me to thinking. Living in Eugene, and attending the culinary program where I did, can be both a blessing and a curse when it comes to food and certain ethical, philisophical, political, and economic concerns. Eugene, being Eugene, is very intensely enthusiastic about the idea of sustainability -- organic, local, seasonal agriculture -- not just for the qality of food, but for the argued environmental benefits. And that enthusiasm carried over into the culinary classroom at LCC. The spring dinner we did was a 100-mile menu, you'll recall. Don't get me wrong -- I'm not against local, seasonal food -- I love the concept, especially as a culinarian. The quality of food is so much better when you get the freshest ingredients, and those that were harvested close enough to you that they actually ripened on the vine. Alice Waters has really pioneered AND solidly proven the validity of the concept at Chez Panisse. But for me, it's more about the quality of food, and the economic benefit to the local economy, which ultimately benefits the restauranteur, since he's essentially paying the people who pay the people who pay him. It's not the moral imperative or grand crusade that it's made into by people who also ascribe to overarching environmentalist movements (such as the Eugene-style neo-hippies with their almost luddite-like abhorrence for anything that smacks of industrialism). Big difference. Granted, that difference is both in quantity and quality, and the two are inversely proportionate, but here's where my dilemma comes in. If I were buying for a high-end restaurant, I'd buy almost all of my produce that way. But I am not a purchaser for a restaurant -- yet. I'm a purchaser for a family -- a family that until recently was living on one income, and is still only on one and a half incomes, until my hours pick up. Those farmer's market veggies will make a wonderful weekend meal splurge, but there's no way I could have afforded to buy all the vegetables my family needs until the next time I shop, if I'd paid farmer;s market prices for all of our vegetables. I understand, the stuff I bought at gigantostore are not all local 9though some was), are not at their peak, are not organic -- but they are AFFORDABLE. I have heard all the arguments about priorities, and the benefits of the "sustainable" produce outweighing their cost, but when the chice is between buying inferior vegetables or insufficient vegetables, I know where the choice lies for my family. I also understand the arguments that the greater the demand for local, organic, seasonal produce, the more farmers will offer it, and the more affordable it will become. But unless you live in a very agriculturally vibrant region, the reality is that the odds are, your local agriculture will never be able to produce enough crops in that manner to feed an entire populations (and if there is data that refutes this belief, by all means, please show me) -- Economy of scale has the upper hand, not to mention the fact that the larger the farming operation, the mote indistinguishable from the model it's purporting to replace it would become. So for the foreseeable future, I don't see this kind of microagriculture as a viable alternative to the industry that agriculture has become, at least not for most consumers -- it is a luxury, albeit one that is accessible to more consumers than most luxuries. And as you can tell from my prior post, like Ferris Bueller referring to Ferraris, I highly recommend it, if you have the means. 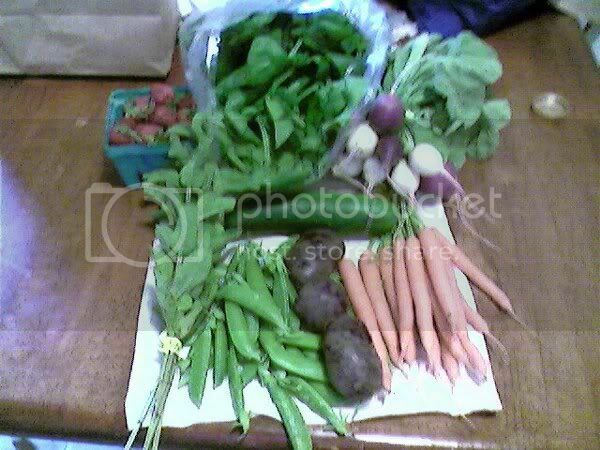 All of this was grown locally, picked fresh, and sold direct to moi. Clockwise from upper left: Strawberries (not those pale pseudo-red styrofoam giant mutants you get in the grocery store, these are compact, seduction-lipstick-blood-red, and co full of flavor they're almost hallucinogenic), spinach, easter egg radishes, carrots, blue potatoes, sugar snap peas, spearmint, and in the center, a cucumber. The potatoes I'll slice thin and fry into chips, the spearmint will garnish the strawberries, everything else goes in a salad. I'll serve it all with some wild Alaskan sockeye (can't get any closer to local, our runs are closed for the year) and pair it with a local Pinot Gris tonight, or maybe a Pinot Noir Rose.